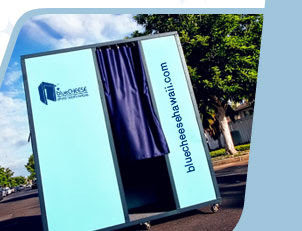 and happened to notice a blue colored photo booth. Standing in front of the booth was Marvin Williams, who, along with his wife Sandra, owns Blue Cheese Hawaii. Sandra Williams also owns Finishing Touch, an event design company and one of our recommended wedding coordinators for our brides. 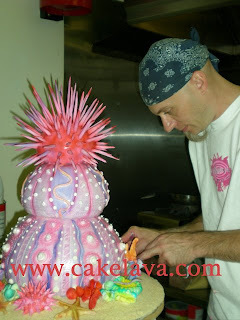 See our Links page on cakelava.com for our list of recommended vendors. Marvin, who has one of those faces where you look at him and you know he's a really nice guy and his assistant were all smiles. He asked Rick and I if we wanted to try out the photo booth. These photo booths bring out the kid in you, and we jumped at the chance to do it. Now I've seen the Blue Cheese name around town but this was the first time we had the full Blue Cheese experience and I gotta say, it's was pretty darn fun to get into the booth and ham it up with my man. I can definitely understand why these photo booths are all the rage now. Looking forward to our next event with cake and a little Cheese, of the Blue Variety. Marvin, anytime you need someone to test out the booth prior to an event, we're totally game! 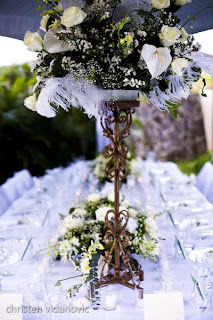 What better way to go into a busy weekend than showcasing a wedding that transports you to another world. 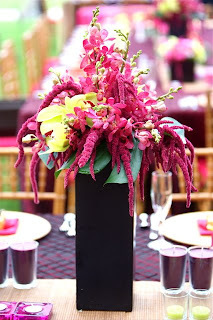 A vibrant fantasy of opulent pinks, purples, greens, and sleek black. The wedding of Sarah and Sean was our January Featured Wedding on cakelava.com and is now up on our myspace page along with the other archived weddings. 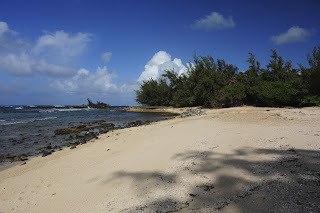 Sarah and Sean were married at the beautiful Turtle Bay Resort on the North Shore of Hawaii. 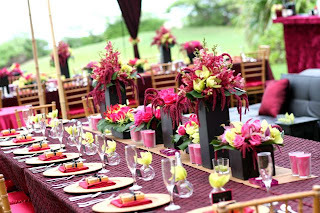 They flew to Hawaii from Chicago for their destination wedding which was planned almost entirely by Veronica Trujillo of Parasol Events using the vision of "Tropical Elegance." 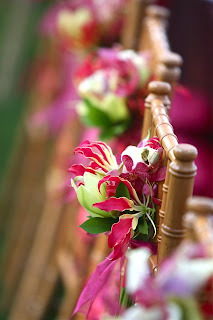 The wedding vendors included, Turtle Bay Resort, the fabulous Stefanie Riedel of Absolutely Loved for photography, Yvonne Chapman of Yvonne Floral Design for the gorgeous flowers, custom linens and tent draping and yours truly for the cake. :-) For their cake they chose our all-bamboo cake with handcrafted flowers in colors that would match their wedding colors. 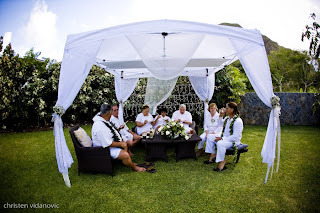 Yvonne built a beautiful fabric and bamboo covering for the cake that would protect it under the clear tent erected on the lawn at Turtle Bay Resort. 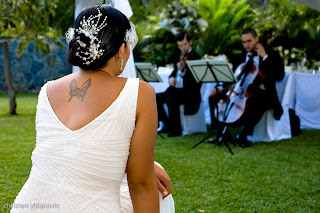 The couple were married in the open air chapel overlooking the ocean at the resort. 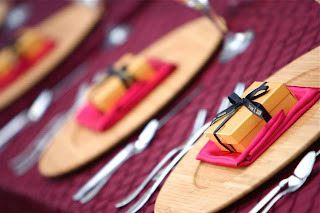 No expense was spared to give the couple and their guests a memorable and entertaining event. 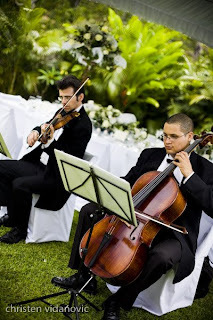 Entertainment included a harp, cello, violin and vocalist for the ceremony and a vocalist and Hawaiian trio for the cocktail hour and reception. "How Sweet it is" was the cake cutting song and "Somewhere Over the Rainbow" was their first dance. This adorable sculpted beaver was one of the many beautiful cakes made for the 6-7-08 wedding date. 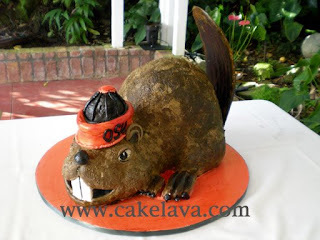 Ordered as a Groom's cake, we were asked to design a sculpted Oregon State University Beaver which included the University's colors of orange and black. I love the little OSU hat! Little did the beaver know that he would get such a reaction from the guests. Even the bride let out a shriek of joy when she saw her groom's cake and it didn't take her long to come over to admire it with her bridesmaids. Before long, Rick had a small crowd of admirers complimenting the cake -- "it's so cool, we don't want to cut it!" The beaver was placed in a prominent position at the entry to the reception where he would greet each and every guest. Alas, all creatures of cake must eventually meet the knife of fate, and when he did, hopefully our Kona Toffee Crunch made with chocolate cake helped alleviate any attachment our bride and her guests had towards the little guy. Incidentally, not long after the OSU sculpted beaver cake went up on cakelava.com, we received a call from a someone inquiring about a sculpted University of Oregon Duck cake. College rivalry is alive and well in the land of cake! I felt inspired to write about the subject of talent after watching America’s Got Talent last night on TV. Rick and I love this show! It’s full of heart and is empowering and entertaining to watch. We usually agree about our favorite and least favorite acts, and have a chuckle over the ones we miss, (like Boy Britney). We also recently heard that last year’s winner, Terry Fator, who was ours as well as America’s first choice, now has a $100 million contract in Las Vegas, with an option to extend for 5 years – amazing! One trait all the acts on America’s Got Talent have in common is their dedication to their craft and endless perseverance. This got me thinking about the abundant talent that runs in our own family. On Rick’s side of the family, we have his mother Joan who makes the most beautiful quilts and who has taken an interest in Hawaiian quilt patterns. Or how about his brother Bill, who is not only a pastor of his church and a full-time father and husband, he also manages to write daily in his thought-provoking blog Provocative Church, which he has done for the past 3 years! I’ve also heard stories about Rick's grandfather who was a very talented Chef. 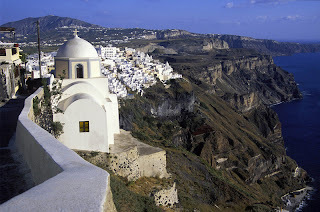 On my side, we have my mother who is an incredible travel photographer who specializes in Europe. 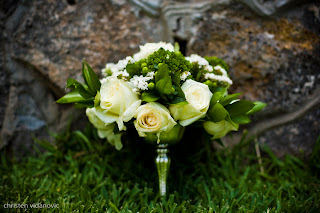 Her company, Linda Lowry Photographics is one of the few non-wedding related links on cakelava.com. 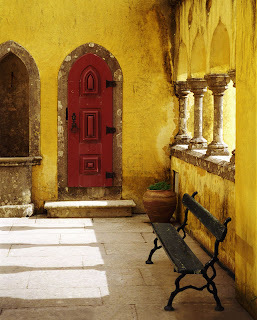 Her work has won numerous awards and receives regular acclaim and she takes some of the most beautiful images of Europe that Rick and I have ever seen. We have a couple of her photos framed in our studio that we enjoy daily. 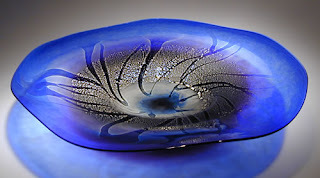 Another talented artist also on our Links page is my step-brother, Chris Lowry, who co-owns Hot Island Glass a glassblowing studio and gallery in Makawao, Maui . 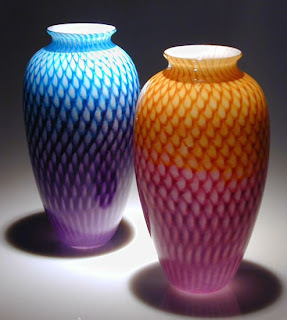 Hot Island Glass brings together two of Hawaii’s leading glassblowers, Chris Lowry and Christopher Richards. 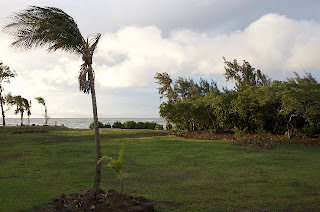 Rick and I had the opportunity to visit the studio of Hot Island Glass when we were on Maui. The gallery is lovely and the work amazing, plus Chris is a really nice guy! 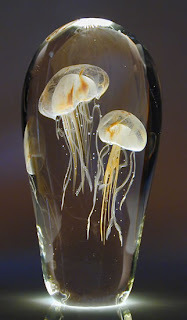 Their glass is also on display at the Maui Ocean Center. 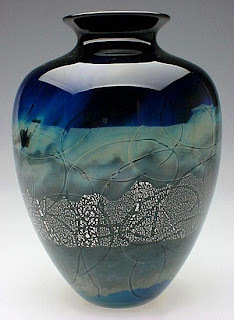 Chris learned glassblowing from his father Bill and many other talented teachers. Bill now focuses more on carpentry and beautiful woodworking and we’re lucky enough to own a few of his handcrafted pieces. As I write this, I look into the kitchen and see my talented husband Rick and think about his tireless dedication to his craft, and all the different influences and mentors who helped nurture and develop his talent. I think about the many talented chefs and business mentors I had the fortune to work with in my craft over the years . Without the presence of talent all around us we wouldn’t have our business. And we are so thankful. On cakelava.com we have a section on our INFO page called "Testimonials" which are posted Thank You letters we've received from clients. Some were sent immediately after the event and others much later. All are appreciated and treasured. The following letters were some that were sent to us during the month of May. Since there are no photos next to the letters I thought it would be fun to post some of the cakes next to their kudos. To anyone reading this who has sent us a letter, we appreciate your taking the time to write us and we're glad you loved your cake! Visit our website to see these cakes and many others, plus a breathtaking new Featured Wedding, beautifully photographed by Cassandra Dieterle Photography. Thank you soooo much Sasha and Rick!! The cake was outstanding and sooo delicious!! My husband and I were just blown away!! I took so many pictures and had everyone eat it, all of it! I couldn't save it because it tasted soo good. Everyone thought that it was so beautiful. 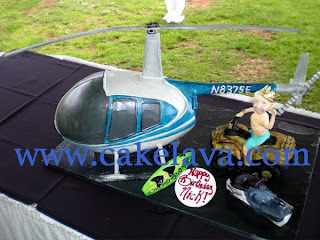 I really appreciate your help and hard work and will be sure to call you for all of my other cake needs. Thank You! 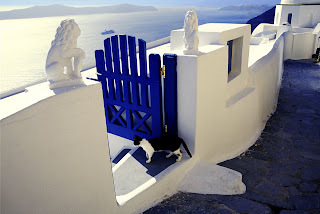 You never fail to amaze us by your wonderful creations! It was a little different getting cupcakes from you instead of a cake, but nonetheless they were amazing. The cupcake was super soft and moist and the frosting was light and had the perfect sweetness. It was probably the best cupcake I've had all year (and I really mean it!) We try cupcakes from various vendors all the time (we're addicted to them) and yours are by far, THE BEST! Thanks for doing an awesome job as always! We just wanted to say "THANK YOU!!!" 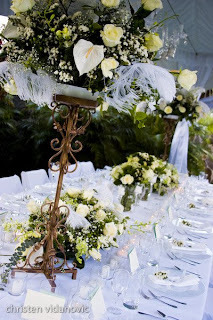 for a wonderful and very dreamy delicious cake you have created for us for our wedding day. All our guests loved it and we loved it so much!!! Your creativity exceeded our expectations. We can't thank you enough! Thank you, you did such a wonderful job on Kaitlyn's 1st Birthday cake. It was both beautiful and delicious. Everyone was amazed and couldn't believe that it was our cake. Thank you again for such a wonderful cake. I will definitely be using your services again. Thank you Thank you Thank you for all that you did and the magic that you pulled in getting the cake up to the top of Mount Everest! It was a feat I didn't think anyone could pull off! And the cake was amazing, people didn't believe it was a cake. Kudos to you both. 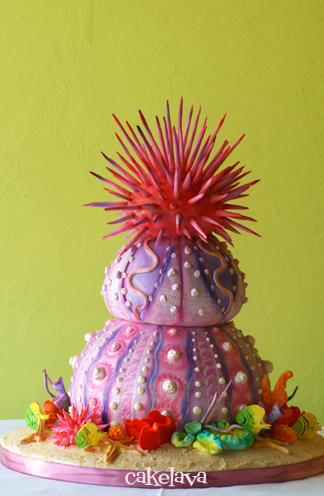 On Saturday, June 14th it was Ricki and Mike’s wedding day, which they celebrated with a colorful custom underwater invertebrates wedding cake. You’ll recall from a previous blog titled “Godzilla and Israel Kamakawiwaole” that the components of Ricki and Mike’s wedding were quite unusual. They were married in a Japanese themed hotel banquet room, their brilliant handmade invitations featured Godzilla on them and included a CD of Hawaiian songs to be played at the wedding, and they had an underwater invertebrates sculpted wedding cake. This past weekend we had two very complicated cakes on the same night, this being one of them. Leaving nothing to chance, we brought in the truly fabulous Dave Miyamoto Photography to capture both of Saturday’s cakes, which are already up on cakelava.com. Dave, who is one of the nicest guys we know and an immensely talented photographer, shot images worthy of a magazine feature. This cake was a lot of fun for Rick to make and the colors really popped! So what kind of flavors does an underwater invertebrates cake have? 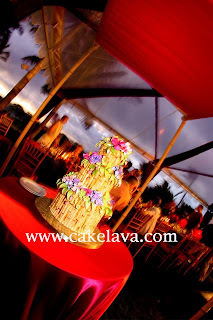 Ricki and Mike chose tropical flavors -- the pink colored Guava Lava for their cake cutting and Hawaii Five-0 on the top 2 tiers. 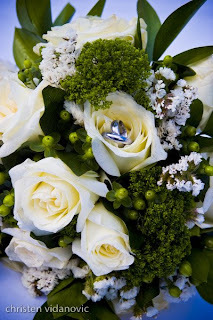 We hope their wedding was everything they dreamed it would be! 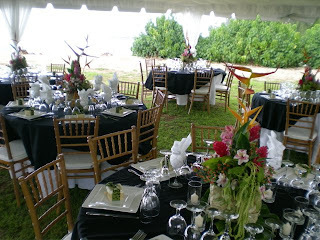 Ipo and Gary’s wedding in Ka’a’awa was an elegant vision in white with beautiful tropical green accents and an Auguste Rodin’s “Le Baiser” (The Kiss) sculpted wedding cake (see yesterday’s blog). They are a warm-hearted and stylish couple, and obviously very much in love. Ipo and Gary wanted their intimate reception to reflect the art and aesthetics so important to them, and no detail was overlooked. 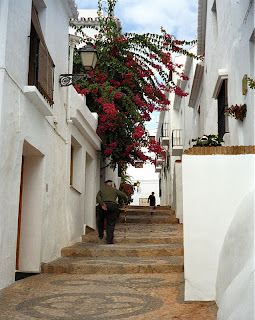 When we arrived at the lovely home, we were greeted by the couple and offered to join them in their celebration. Though we were unable to stay, they asked their photographer to take a photo with us (see below). 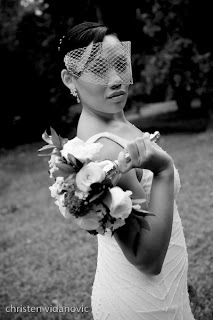 For more of Christen’s amazing images, check out her Nineteen Owls website and blog. 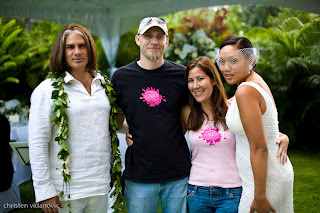 Ipo and Gary were married on May 10, 2008 at a lovely home in Ka’a’awa, on the Windward side of Oahu. When we met with the couple initially, they expressed how important art was to them and how they wanted to have Auguste Rodin’s “The Kiss” (Le Baiser) sculpted for their wedding cake. We knew it would be a tremendous feat to make “The Kiss” but Rick embraced the challenge to make one of the most difficult and recognizable sculptures out there. To bring a Hawaiian element to the cake, handcrafted plumeria flowers were added both at the base of the cake and in the woman's hair. For the cake filling, there was two ways it could be done -- we could either fill the cake with buttercream which can be easier to work with but something we choose not to do for our cakes -- or to fill the cake with the couple’s chosen flavor, “Local Kine Special” and what Rick opted to do for Ipo and Gary. He didn’t want to sacrifice any of the flavor for the sake of the look of the cake. Our “Local Kine Special” flavor is coconut cake with sweet taro cream filling. 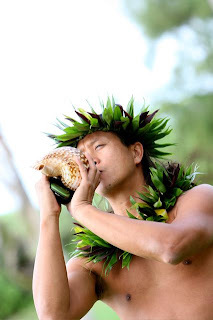 Taro is a nutritious starch commonly used in Hawaii and is found in poi, a Hawaiian staple food. According to Rick, Rodin’s “The Kiss” sculpted, was one of the most difficult cakes he has ever had to make. We are thankful to Ipo and Gary for the opportunity. 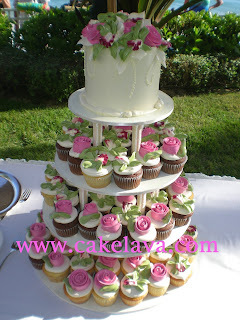 See this and many other new photos on cakelava.com soon! We were smitten over the weekend when we saw this Thank You photo card sent to us by one of our clients. Rick made her daughter Ashely a sculpted Ladybug cake last month for her 1st birthday. 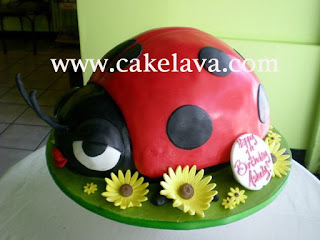 We will post our sculpted ladybug and many other new cake photos on our website soon. The card begins with "Dear Rick and Sasha, Thank You! Ladybugs are lucky and I'm lucky too, because I celebrated my 1st birthday with special people like you. " Thank you for my beautiful "ladybug" birthday cake. It was the highlight of my birthday party. The cake was so adorable and cute! Thanks Rick for an awesome cake! Guests at the party couldn't believe it was a cake. So many compliments on her cake! It not only looked good, it tasted good :-) Sasha, thanks for all your help. I wish I met you both. 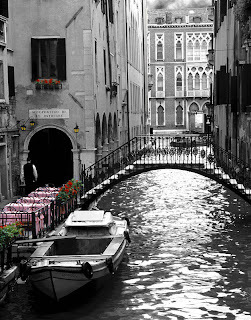 I was busy decorating the restaurant. It was a pleasure working with you! Thanks cakelava! Rachel, Gary & Ashely P. "
We're the lucky ones! Thank you for giving us the opportunity to create the Ladybug cake for Ashely. She's such a cute little girl who looked absolutely adorable in her ladybug costume! We will look foraward to more celebrations with your family.